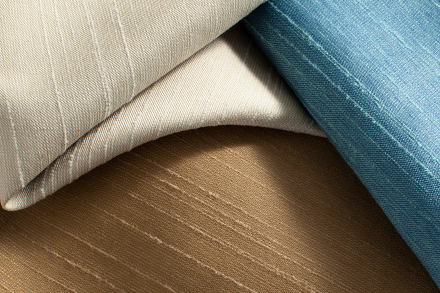 Over two years in development and in partnership with Unifi, Momentum Textiles introduces the first significant new recycled fiber in over 15 years. 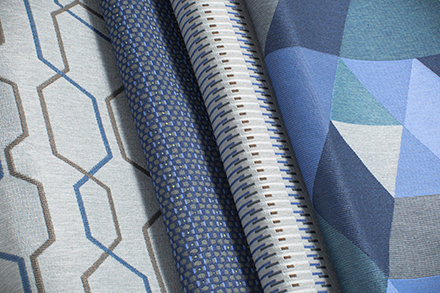 With 32 total patterns, there is simply no other textile collection on the market that can offer such a winning combination of performance and sustainability attributes. 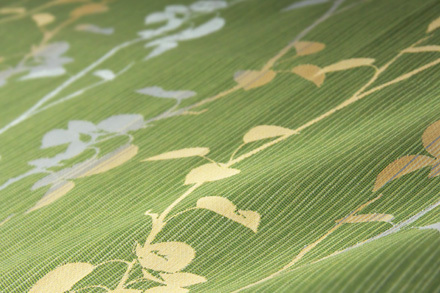 Simplified leaves swirl across a massive repeat celebrating the beautiful chaos of nature. 6 colors | 100,000 D.R. 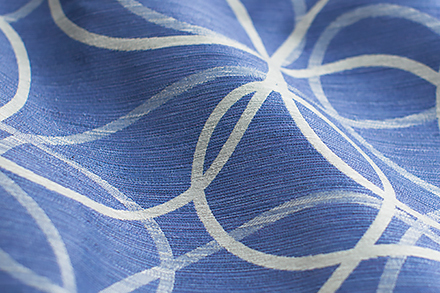 Expressive ebbs and flows in fiber density transform what could be a simple solid into a covetable classic. 16 colors | 100,000 D.R. 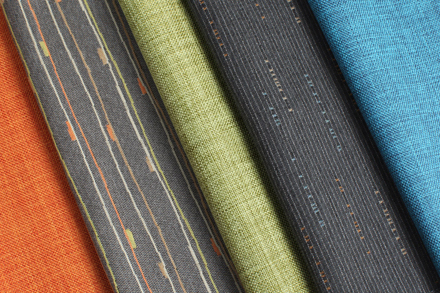 A preppy, refined counterpart to Rubato and Quince, Croquet is a plaid formed by tiny dots and fine lines. 13 colors | 100,000 D.R. Inspired by block printing techniques, Reveal features wood cross-sections layered on top of a richly textured weave. 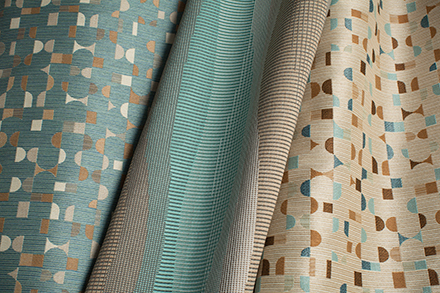 Rows of imprecise dots and dashes in three alternating colors create a look that is both tailored and organic. A pattern within a pattern, Trivia is made from a prismatic assembly of many-colored triangles and trapezoids. 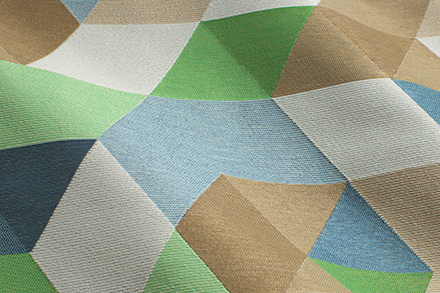 Phrase is a versatile, small-scale geometric design that offers four distinct colors per sku. 12 colors | 100,000 D.R. 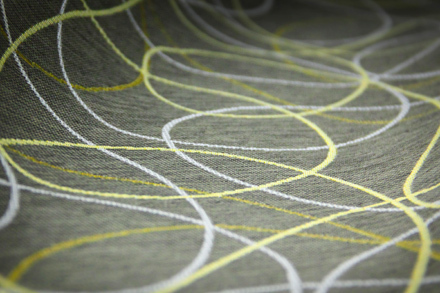 Story features narrow, precise linework that traces angular paths across a large repeat. 8 colors | 100,000 D.R. 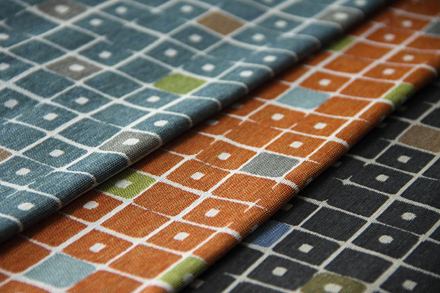 A pattern of small-scale rectangles that are stacked in vertical rows to form stripes and create rhythm. 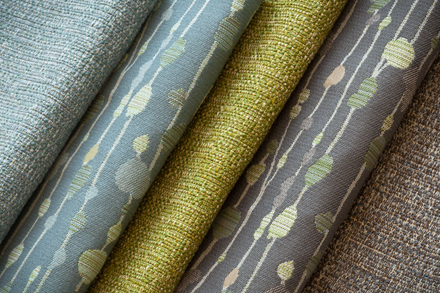 A breezy, loopy pattern with richly detailed weaves. An impression of stream currents is created through waving stripes of color overlaid by light and dark crossing lines. A study in geometry, Essay features elegant shapes balanced in irregular repetition over a strié ground. 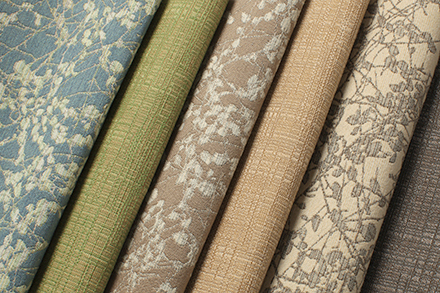 This botanical pattern is depicted with a wild, natural grace - conveying delicacy without feeling too sweet. 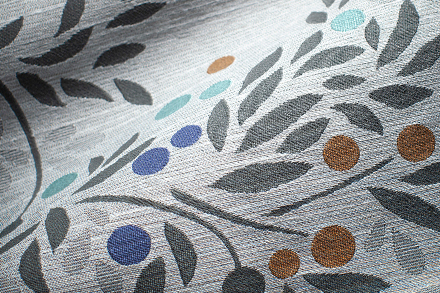 This textural plain was created with ultra-fine yarns, resulting in a soft hand with subtle dimension. 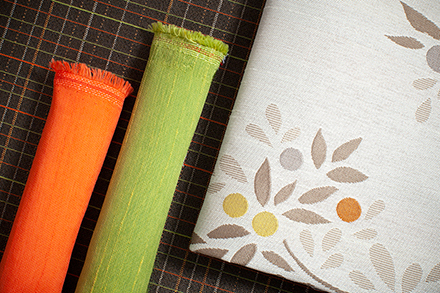 Brimming with positivity, this stylized botanical pattern pairs neutral ground colors with multi-colored blooms. 8 colors | 150,000 D.R. 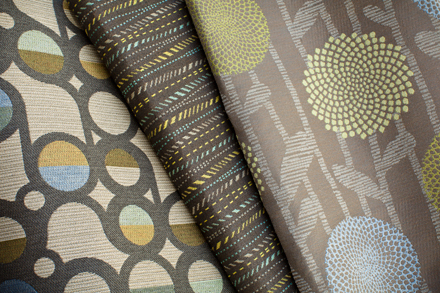 This rhythmic pattern explores balance through the use of harmonious color, organic textures and varying line widths. 9 colors | 300,000 D.R. Dashes of color that ebb and flow in energetic currents to imply movement, progress and resilience. Curvilinear shapes and carefully balanced geometry infuse this pattern with a sense of purity and equilibrium. Graceful, artistic lines representing branches provide a backdrop over which colorful accents are scattered. 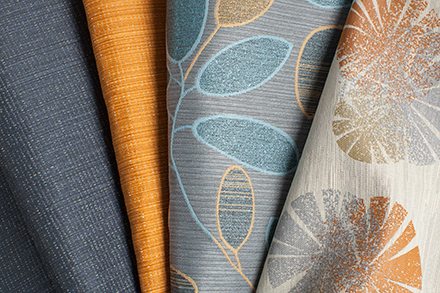 This tactile pattern achieves the perfect balance between refinement and organic texture. 9 colors | 500,000 D.R. 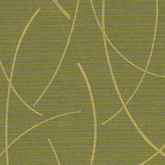 Camber features fine lines punctuated by blips of color arranged horizontally across the surface. 9 colors | 200,000 D.R. 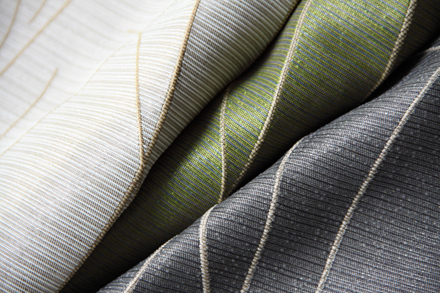 This small scale pattern is defined by a subtle pinstriped ground accented by small dashes of color. 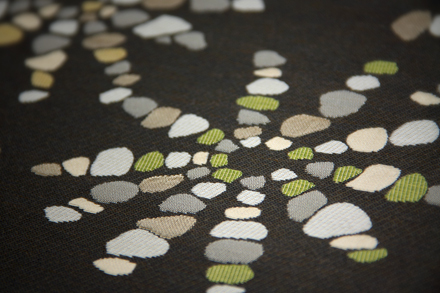 Vines wind across this thoughtfully constructed textile creating a soothing textural and visual experience. 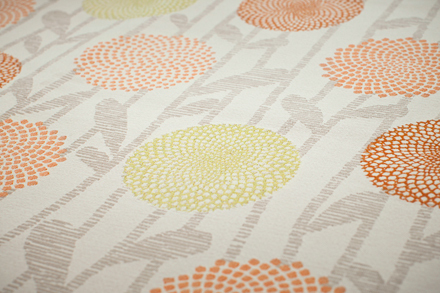 Populated with stylized buds and blooms, this pattern features a kaleidoscopic mix of shapes and colors. 5 colors | 100,000 D.R. 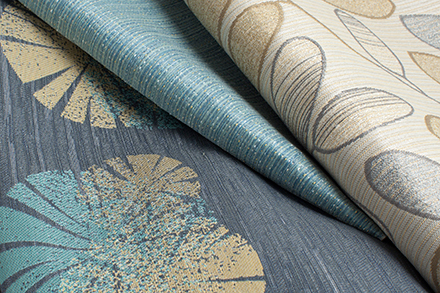 This multi-layered work features a textured surface reminiscent of the organic elements used for inspiration. Imbued with simplicity, lines gather and disperse expressively, adding dimension to the color. 10 colors | 100,000 D.R. Inspired by the art of rock balancing, organic elements are meticulously arranged to form larger scale star-like motifs. The interplay between the contour pattern and colored blooms illustrate unique spacial conceptions of land artists. 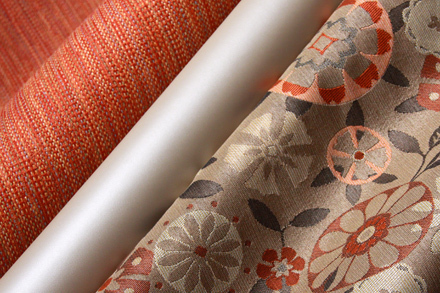 A colorful display of linework, artfully entwined to create layers of intricacy and transparency throughout the design. 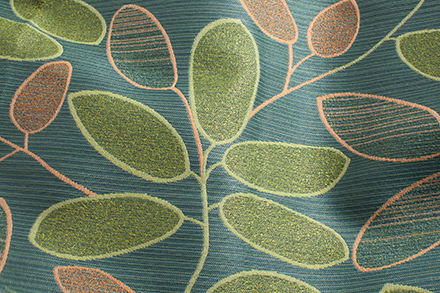 This meandering leaf design uses free-flowing botanical motifs brings forth a sense of calm and simplicity.